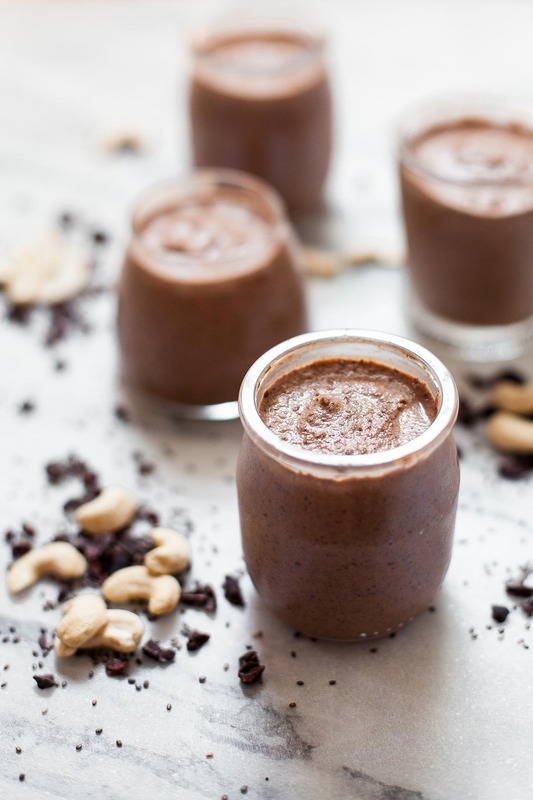 This cashew chia cacao nib pudding is paleo, gluten-free, and easily made vegan. It’s also a snap to make and surprisingly satisfying! Since this pudding is a make-ahead dessert, it’s perfect for having guests over. While you’re out grilling lamb burgers and mixing drinks (agua fresca, perhaps?) these perfectly-sized treats will just be gelling in the fridge. This was my first time using chia seeds and cacao nibs, and I loved them both. 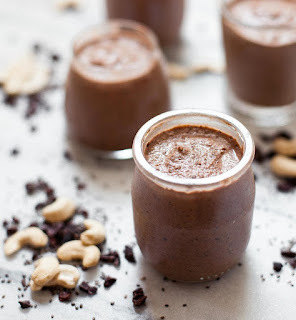 I wasn’t sure how I’d feel about the cacao nibs since they’re unsweetened chocolate, but while I wouldn’t necessarily eat a handful plain, they were perfect in this pudding. 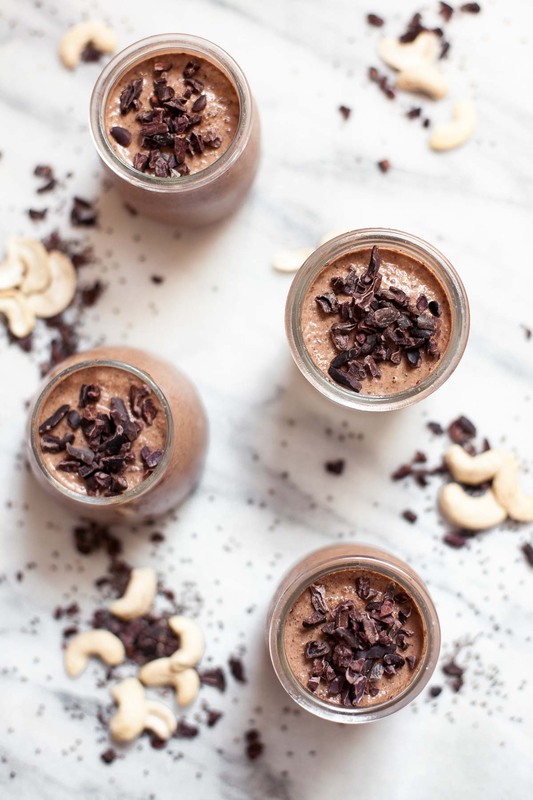 Some of the cacao nibs are blended with the cashew and chia base to deepen the chocolate flavors of the entire pudding, and some are sprinkled whole on top. This gives each bite of cashew chia pudding this craveworthy chocolatey crunch. It’s so good! I ordered the cacao nibs and chia seeds from Thrive Market, which is my new favorite place to shop. 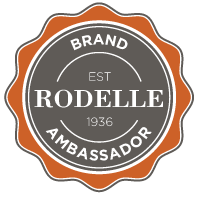 It’s a membership site, kind of like a virtual Costco, but it’s worth it because they have so many paleo-friendly ingredients and snacks at significantly reduced prices. (The links to Thrive in this paragraph are my referral links, which means I’ll get some free merchandise from them if you sign up using my link. They also give away a free membership to a family in need for every paid member that signs up!) Thrive often sends out great discount codes to use on their already discounted products–I got my whole first haul at 30% off (see it on Insta here). I highly recommend checking out Thrive if you haven’t already! What are you making for the 4th? I still haven’t totally finalized my menu, so I’d love to hear your ideas in the comments! 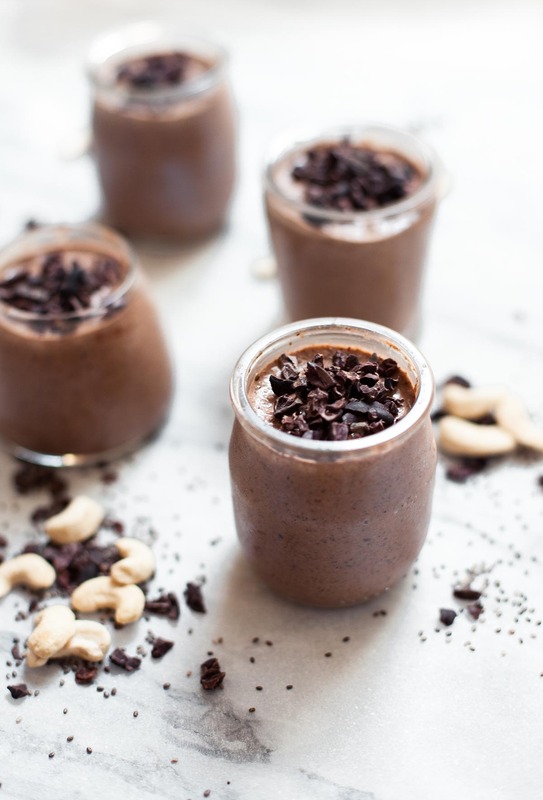 This cashew chia cacao nib pudding is paleo, gluten-free, and easily made vegan. It's also a snap to make and surprisingly satisfying! Soak the cashews in cool water for at least 2 hours or up to overnight. Drain and rinse the nuts and place them in a blender. Add the remaining ingredients and 1 cup of water. Blend until smooth, up to 3 minutes depending on the strength of your blender. Transfer the pudding to a serving dish or individual ramekins, cover, and refrigerate for about 2 hours, or until set. 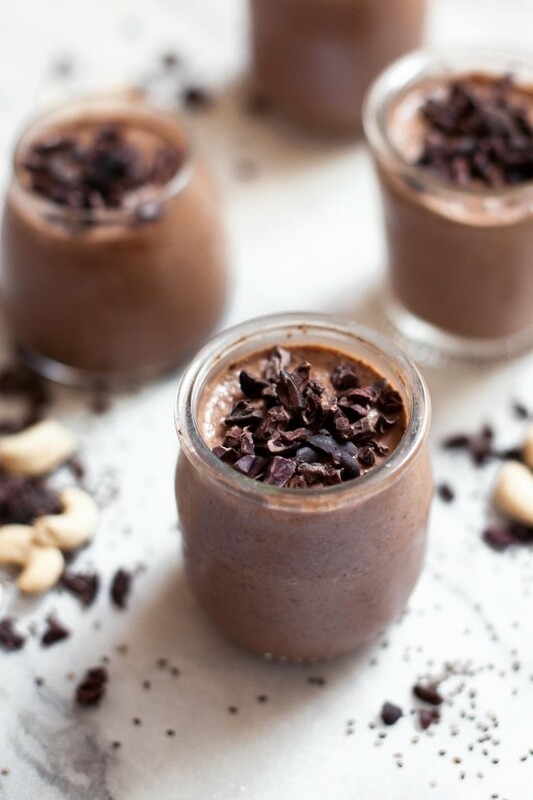 Top with additional cacao nibs, fruit, coconut, or other nuts as desired and serve. Best enjoyed within 24 hours. This post contains affiliate links. If you make a purchase from Thrive Market after clicking one of my links, I receive a small commission (the price you pay is not affected). Thank you so much for supporting my site! Mmm, I can't wait to try this! Sounds like a great healthy treat, and I love the little jars you photographed it in. Pinning and sharing! What an incredibly delicious chia pudding. 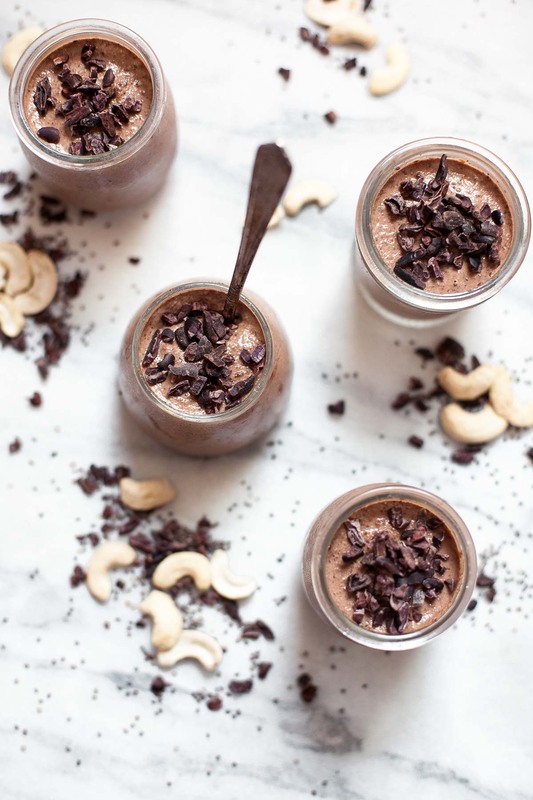 A healthy chocolate recipe is always an instant winner in my books. Thank you so much, Thalia! I agree–it is hard to pass up healthy chocolate. This looks so yum! I just got a bunch of chia seeds; will need to make some pudding! Thank you so much, Heather! Hope you love it as much as I did. I've made this twice already and it was great! Yay!! I'm so happy you liked it. Thank you so much, Matt! I'm starting to play around with cashew cream more, and I love how versatile it is. This chia pudding looks great! Thank you, Lisa! Yes, cashew cream is great in so many sweet and savory things! This looks like what I want for breakfast all week! Oh wow; these babies would be a perfect for parties. Love the look of them! Oh, cool! I'll have to check out Bobby's recicpe. Thank you so much, Prash. I bought a bag of cocoa nibs that I've been meaning to use for SOME kind of dessert, and until now, I wasn't able to find anything that looked good enough! This pudding looks delicious! Definitely a lot less crazy than some of the 4th foods that will be popping up, so it's a nice change of pace. 🙂 I'm making an apple galette for the weekend festivities, so something relatively simple. Thanks so much for sharing this!! I have everything I need to make this! Awesome, Pam! Hope you enjoy it!